Typo Gra­phic Design ■ type design & visual com­mu­ni­ca­tion. A young and inde­pen­dent font foundry from Manuel Vier­gutz based in Ger­many, Ber­lin. Design of digi­tal type­face in the form of deco­ra­tive fonts for play­ful head­lines or exclu­sive type­faces as a cor­po­rate font for bran­ding. Catchy, indi­vi­dual type­faces with per­so­nal, strong cha­rac­ter. From strictly geo­me­tri­cally con­struc­ted over rouge & dirty to free, hand­made and expe­ri­men­tal type­faces. Fresh & striking head­line fonts. The let­ters, num­bers and dingbats/symbols are plea­sed to supply gra­phic desi­gners, illus­tra­tors, prin­ters, web desi­gners and adver­ti­sing agen­cies with fonts world­wide. Using modern OpenType-Feature fun like con­text­ual alter­na­tes, con­text­ual liga­tures, dis­cre­tio­nary liga­tures and symbols/dingbats (arrows, orna­ments, pic­to­gram), thus the fonts are play­ful app­lica­ble and cover a high range of gly­phs. 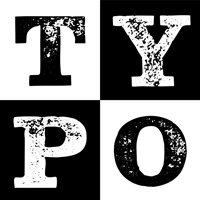 The design style of the Typo Gra­phic Design fonts is char­ming imper­fect & human.